RockPaperShotgun – one of the few games “journalism” (hah!) 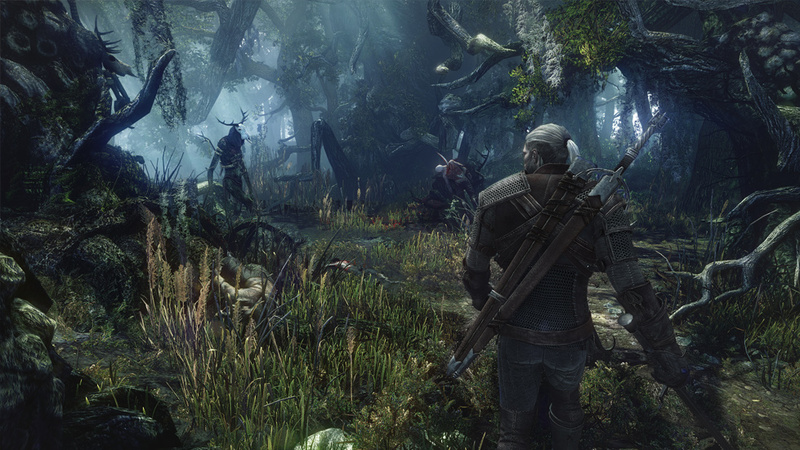 sites I read – just syndicated another video from the Eurogamer Expo, this one is on the Witcher 3. The video itself is not worth watching – it contains (after the requisite 8 minutes of watching people walking into a room) two trailers that were previously released, and a fairly unenlightening talk. Those of us who have just tuned in may not be familiar with the Witcher series. It started as a series of stories (novels and shorts) from Polish author Andrzej Sapkowski. 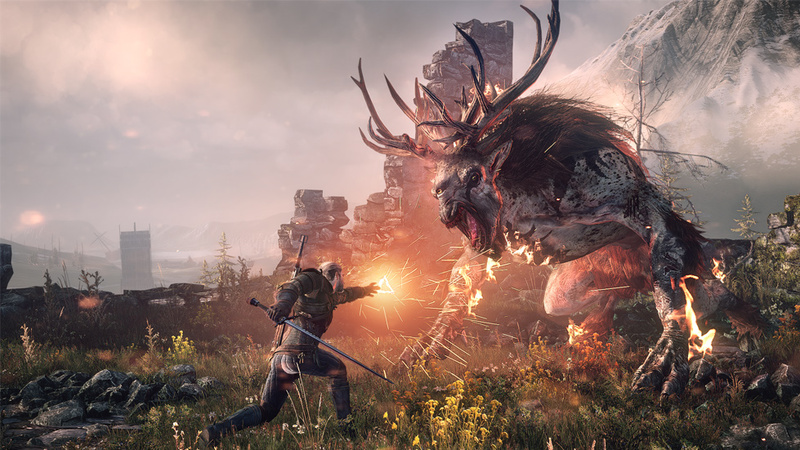 Surprisingly, that’s all you need to know about the source material – as CD Projekt – a game studio that (I believe) got its start doing translations for other companies (notably Interplay, in the form of the Polish edition of Baldur’s Gate), took the setting and characters and ran with it, picking up where the author left off to make the Neverwinter Nights-Engine powered The Witcher. The game was pretty good, managing to bury a workable RPG system and a pretty good story under layers of that indescribable roughness that European games have. I liked it a lot, but what I really liked was its sequel, the ensubtitled Witcher 2: Assassins of Kings. At this point, if you are an RPG fan and haven’t played it, go to GOG (another CD Projekt company) and buy it. Immediately. 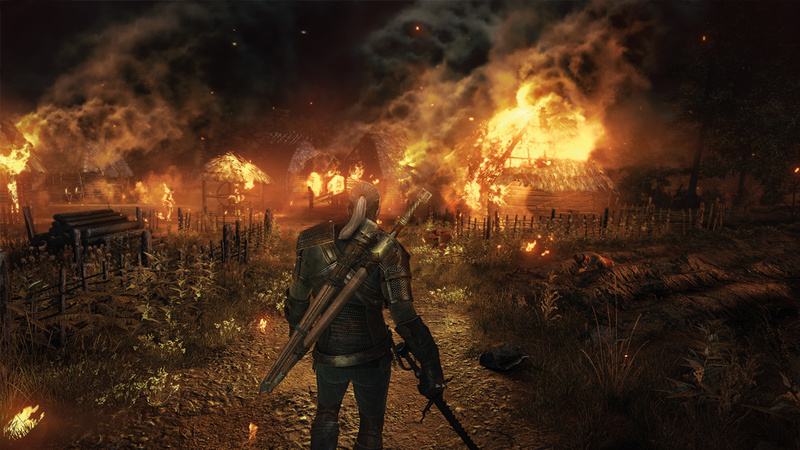 TW2 still had the Euro-game charm (to be honest, I think it’s something about their UIs and sound design – I think they just don’t have the feedback right), but it delivered in spades with an incredible story, amazing characterization (of the main characters, that is – the side quests… not so much), and an adventure that felt driven and personal. This was all topped with a gooey layer of visuals, TW2’s engine and art design is beautiful. Okay, with the table set, let’s move on to the main course: what is interesting about the talk has to do with The Witcher 3 being an open world game. This poses a lot of interesting questions (concerns?) that the presentation was meant to address. Now, don’t get me wrong, I like open world games. Skyrim, Oblivion, Fallout, Morrowind etc are all games that I have sunk hundreds of hours in to, but they provide a different experience. Skyrim, for example, isn’t really about the story; it’s equal parts exploration, killing people during exploration, and real estate. Well, that and wondering who on earth makes those top mods on Nexus*. As an aside, I find particularly amusing that Dragon Age 3 was originally going to be open world-ish, although it looks like they’ve toned that down a bit. In the case of DA3, I think it was mainly due to Dragon Age 2 being an absolute pile of garbage and having no retention. Some exec probably went “oh, we didn’t sell 10 million units? I hear Skyrim did! Make that!”** However, the CD Projekt guy went to great pains to claim it was an “immersion building” “technique” rather than a back of the box dot point. So the question posed (by his powerpoint) was, essentially: “how can you make an open world game and keep the narrative focused and cinematic?” It’s a really difficult question to answer; players (much like artists – programmer joke) just do not do what you expect them to – and if you give them the ability to walk around freely, the problem multiplies immensely. TW2 had a lot of tense situations which would have completely broken down if you could have gone for a long stroll down on the beach or decided to pick some mushrooms and relax in your comfy house. Any sense of urgency driving a narrative is going to be short circuited before the first jizzing dicknipple mod is hot out of the festering pits of the Nexus Network. I can only assume they will play fast and loose with the freedom of the player, locking them in a scene until the next block of the main quest resolves itself. Another point he made (to himself) was that open world games have a nasty habit of becoming quite generic and repetitive (*cough* Bethesda *cough*), although he gave some lame reason why that wouldn’t be an issue in TW3 (the reason was so weak I can’t even paraphrase it, and that is unheard of). They’ve also attacked these issues as they appear in Skyrim and said that they will avoid them using ~*methods*~. Finally, he mentioned problems that players might have following the interaction between NPCs and factions, especially if you’re not railroaded in a traditional way. This is probably not as big an issue for CDPR, as they have some really, really good character writers and their NPC design is probably the best in the business right now. Also unlike Skyrim, they may hire more than 3 voice actors, which would go a long way to providing diversity. Mind you, they also mentioned a concrete solution to that, animated “storybooks” and flashbacks. It sounds okay in theory, but it’s one of those things that could come off very cheesy and strange – just try imagining how the game will explain things to you; yes, this person hates you because you murdered his whole family, remember? [cut to flaming village and moody voiceover] [cut back to conversation – unlock new dialogue option]. I don’t want to see one of the best RPG franchises compromised by trying to chase an unreasonable goal, but on the other hand, at least they know it’s a concern. Something he didn’t mention is overall progression – if I choose to go to city B before city A, what happens? The fact that RPGs have a character who becomes stronger during the game causes horrible scaling issues when the design isn’t laid out. I mean, Bethesda’s level scaling is notoriously bad, but it is in many ways a necessary evil. Fallout 3: New Vegas tried really hard to get you to go a certain route, by putting impassable mountains and insta-kill monsters across many of the paths over the map, but when you do that I think you need to ask yourself what you’re getting from the open world after all. Not to mention issues around a coherent main plot – I don’t see CDPR going down the Bioware “4 disconnected regions and a finale” approach to game design, but it is another way to solve the issue. It’ll be an interesting product, that’s for sure. I’m hoping to eat my misgivings for lunch once it comes out and blows us away. Maybe it’ll set a precedent – a cinematic, rich adventure set in a completely different framework. I can only hope. ** Also because DA3 is built on Frostbite (3? ), it theoretically could do quite big game worlds.